Lightly fry the potato slices and take them into a large Pyrex dish. Cover the bottom with potatoes and sprinkle some salt. Then set aside the rest of the fried potatoes. Meanwhile, cook ground beef over medium heat in a skillet. Once it absorbs its own juice stir in oil and onions. Saute for 3-4 minutes. Add 1 diced tomato and salt. Cook for a couple of minutes, add the spices and turn the heat off. 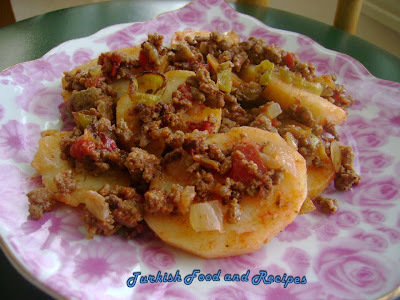 Spread half of the ground beef mixture over the potatoes and place the remaining potato slices over (see the picture). Spread the rest of the mixture all over evenly. Place the tomato slices and peppers on top. Mix the sauce ingredients in a small bowl and pour all over the Mousaka. Bake it in a preheated 350F (180C) oven for about 35-40 minutes. Patatesleri kizgin yagda hafifce kizartin ve genis bir borcam tepsinin dibine dizin. Uzerlerine tuz serpin. Kalan kizarmis patates dilimlerini kenara ayirin. Bu sirada bir tavada kiymayi suyunu cekene dek orta ateste pisirin. Sivi yagi ve sogani ilave edin. 3-4 dakika soteleyin. Tuz ve 1 tane dogranmis domatesi ilave edin. Bir kac dakika daha pisirin ve baharatlari ilave ettikten sonra atesten alin. Firin tepsisindeki patateslerin uzerine kiyma karisiminin yarisini yayin. 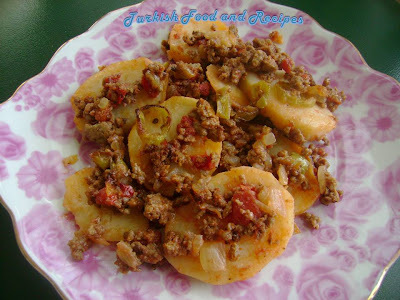 Uzerine, kalan patatesleri yayin ve kiyma karisiminin diger yarisini esit olarak dagitin (resime bakiniz). Uzerine domates ve biberleri yerlestirin. Bir kasede sos malzemelerini guzelce karistirin ve sosu tepsinin uzerinde gezdirin. Onceden isitilmis 180C (350F) firinda yaklasik 35-40 dakika kadar pisirin. Patates Musakka’yi sicak servis yapin. bence bu yemege kimyon koyulmaz.